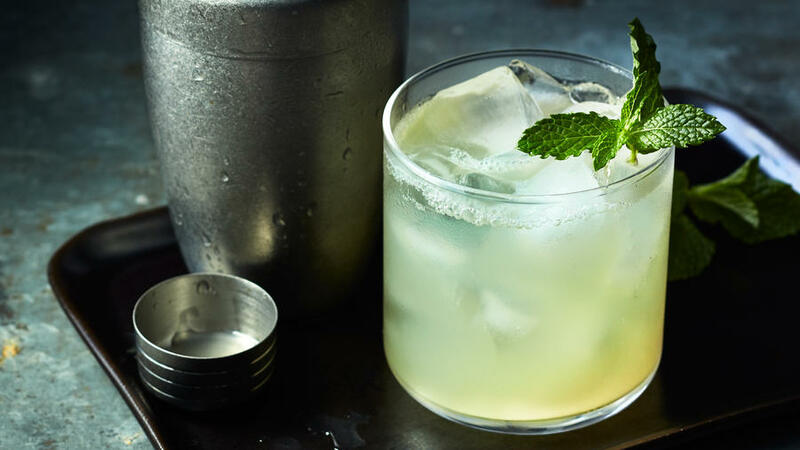 A little tart and a little sweet, this mocktail of lemon-lime juice and pear juice will wake up your taste buds. Add a splash of seltzer and an herb garnish for a special presentation. Put all ingredients except mint sprig in a cocktail shaker and shake until well blended, about 10 seconds. Pour drink with ice into a tumbler or a snifter. Garnish with mint sprig. Note: Nutritional analysis is per mocktail. Bar Essentials: Have these on hand for mixing great mocktails. Lemon-Lime Juice: Equal parts freshly squeezed lemon and lime juice, for adding acidity in a flash. Fresh Lemons, Limes, and Oranges: To make juice, wedges for squeezing or moistening the rim of a glass, or twists of zest for extra citrus aroma. Superfine Sugar: Dissolves easily and makes a nice garnish on the rim of a glass. Fresh Herbs: Basil, mint, and tarragon add complexity, texture, and visual appeal. Purchased Ice: For a big party, it's hard to make enough ice at home. Besides cooling, ice helps blend flavors in the shaker. Был найден мной популярный сайт про направление www.rbt.com.ua.